Deputy Defense MinisterRabbi Eli Ben-Dahan (Jewish Home) spoke with Arutz Sheva about a range of issues, including Prime Minister Binyamin Netanyahu's intention to allow soccer matches on Saturdays, the decision to grant municipal status to the Jewish community in Hevron, and the ongoing struggle by the Jews who purchased the Machpela House in Hevron to live in their own property. 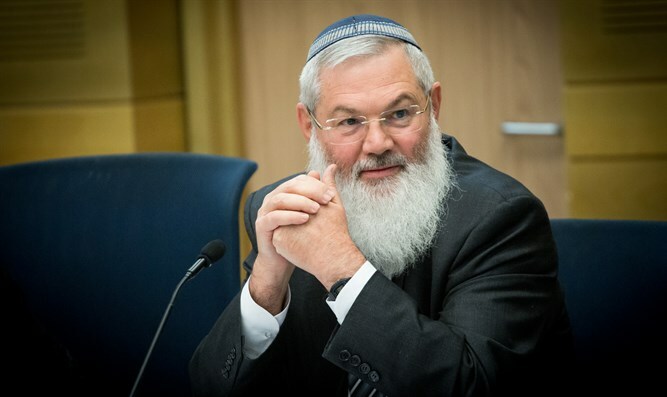 Rabbi Ben-Dahan criticized the prime minister's plans to allow soccer matches on Shabbat. "Shabbat is the greatest gift that the Jewish people has ever given the world," Rabbi Ben-Dahan said. "Shabbat is important for all of us." When will we begin to see the paving of bypass roads in Judea and Samaria? "In the last year and a half we have been working on the planning of bypass roads. Now the planning is done, and we are waiting for the budget already approved by the government. The bypass roads will be a blessing for all residents of Judea and Samaria, and they will strengthen Judea and Samaria communities, as well as adding to safety and security on the roads." Last week, the defense minister granted municipal authority to the Jewish community in Hevron. What challenges will we see on the ground? "Until now, the Jewish community of Hevron was associated with the Arab city of Hevron, and had no authority. The Jews of Hevron could not receive budgets from government ministries, They could not carry out tenders or maintenance work for the welfare of the Jewish residents of Hevron. They were dependent on the Arab city of Hevron following the Wye Agreement. "I am pleased that Defense Minister Shaked and the legal advisor for Judea and Samaria, and myself worked together and issued this special order - which was signed by the Chief of Staff - and I hope that this move will strengthen the Jewish community in Hevron." Do you expect the Supreme Court to allow the Jews to live in Machpela House? "The legal advisor of the defense ministry allowed the residents of the Machpela House to remain in the Machpela House because the purchase was lawful, but the Attorney General requested that the families leave the Machpela House until the initial registration is completed. Jews have the right to buy and live anywhere in the Land of Israel. "There is a problem with the purchasing process, because the Palestinian Authority passed a law that sentences anyone who sells a house or land to a Jew to death. And this no one talks about, All these great human rights activists are silent. We have to undermine the law that decrees death for Arabs who sell land to Jews."